It's easy to like Michael J. 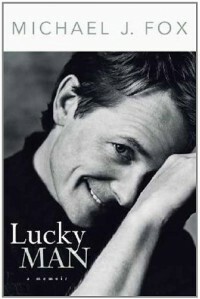 Fox's memoir about his career and life as it's been shaped by Parkinson's disease. It's a smooth read and the glimpse behind the curtain is sometimes fascinating. I admit to starting this book in the grip of a teensy bit of cynicism (a plucky, out-of-control actor is stricken by a life-threatening disease, maturing even as it tightens its grip on him), but ultimately, I believe Fox is sincere when he says he wants to tell his story, and inspire hope instead of sympathy. In a smooth, straightforward way, he tells the story of coming to grips with his disease, and how he's grown as a person in the face of his symptoms. There's little doubt that Fox is not delving into the deepest recesses of his struggle with Parkinson's, but then, this isn't a story about the disease; it's a story about what it means to not fall before it.